The cleanup efforts at Fukushima's nuclear facility are been peppered with robotics: packbots, a refitted TALON, even a UAV - but Toshiba figures it could use at least one more. 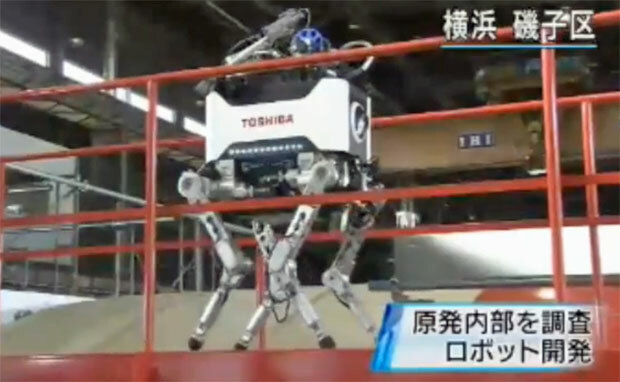 The firm's contribution is known only as the Quadruped walking robot, and it looks somewhat like Boston Dynamics' AlphaDog. Shuffling along on four double-jointed legs, the Quadruped can traverse uneven terrain and stairs at 0.6 mph, and is capable of exploring uninhabitable and irradiated areas for two hours before requiring a recharge. A second robot rides on the Quadruped's back, and can explore tight spaces for up to an hour when tethered to the its mentor. Toshiba is outfitting the duo with cameras and radiation dosimeters, and hopes to use them to help officials survey the damage in the plant's deadlier corners. Check out the machine's official press demonstration in the video after the break.